As promised in our previous article we have come up with the configuration from JBoss AS 5.1 side which would help everyone to consume messages from Websphere MQ 7 which is residing on a remote box. In this article we will see how can one send messages (i.e. using a JAVA standalone code) to a remote queue on Box-1 having Websphere MQ 7 and those messages can be received by the consumer (i.e. using EJB3 MDB deployed on JBoss) from Box-2 which is a very basic scenario in most of the people. The main concept for this is that we would be sending messages to the remote queue of Websphere MQ 7 on box-1 and on box-2 we would be creating a Websphere MQ provider which would have the URL and InitialContextFactory of the Websphere MQ having the queue on box-1 and using that Websphere MQ provider we would connect to the connection factory and would connect to the queue for Websphere MQ which is on box-1. Once we get the access of connection factory and queue we would just create an MDB which would using the Websphere MQ provider details and would be able to consume message from box-2 easily. In this box we have a JBoss node called Node-1 and following things has to be done on this box. Note: In “wsIBMmq-provider-service.xml” file you have to change the 10.10.10.10 with the your remote server name/IP address of the remote server on which MQ 7 is running and same goes for 1415 and MyRemoteChannel. After following the above given steps, we have successfully configured all the setting from JBoss end. Now its time to test our configuration by following the below steps. Create a Directory somewhere in your file system like: “/urs/JBoss/JBM/Queue” to write the QueueSend.java and as we have an MDB we would not need a QueueReceive.java programs. Now open just 1 – command prompt and run the “. ./setMQ_CLASSPATH.sh” by adding two DOTs separated by a single space, in both the prompts to set the Environment (PATH & CLASSPATH). echo "Exporting CLASSPATH for IBM MQ...."
Then compile the QueueSend.java programs. Once everything is up and running properly you just have to send around few messages in “Prompt-1” and you would notice that those messages would be shown in shell on which the Node-1 is running which is on Box-2. 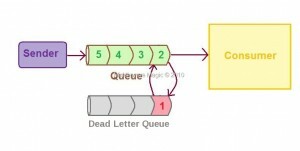 Hence when you are sending a messages to the Websphere MQ 7 queue which is on Box-1 the same messages are been consumed by the MDB which is been deployed on Node-1 running on Box-2. In this article we would be talking about JBoss messaging bridge and how to configure it in JBoss AS5. Hence in simple words JBoss messaging bridge is a type of forwarding mechanism for messages, which also provides interoperability between JBoss JMS implementations and between any non JBoss Messaging JMS servers, as long as they are JMS 1.1 compliant like MQ or even can be used between two different JBoss nodes on the same box or different boxes. The JBoss messaging bridge also has built in resilience to failure so if the source or the target server connection is lost, which can be due to network failure or the any one of them have gone down then the JBoss messaging bridge can retry connecting to the source and/or target until they come back on-line. When this happens it will resume operation as normal. How does Messaging Bridge works? As I told you that messaging bridge is a type of forwarding mechanism in which it has a Source Destination and a Target Destination which is been used to send the messages from one place to other. Source Destination – Means from where the messages are been read/picked up. Target Destination – Means where the picked up messages has to be sent. So its totally dependent on once usage how to use the JBoss messaging bridge for pulling the messages or for sending the messages you can use it in both ways. Note: In “remote-jms-ds.xml” file you have to change the 10.10.10.10 with the your remote server name/IP address of the remote server. Create a Directory somewhere in your file system like: “/urs/JBoss/JBM/Queue” to write the QueueSend.java to send messages to the source destination which is on Box-2’s queue which is TestQ and then we would use QueueRecerive.java to receive messages from the target destination which is on Box-1’s queue which is remoteTestQ. Now open just 2 – command prompt and run the “. ./setJBossEnv.sh” by adding two DOTs separated by a single space, in both the prompts to set the Environment (PATH & CLASSPATH). Then compile both the codes the QueueSend.java and QueueReceive.javaprograms. Once this is been done try to sending some messages in the Prompt-1 which can be revived on Prompt-2. Once everything is up and running properly you just have to send around few messages in “Prompt-1” and you would notice that those messages would be shown Prompt-2 which is running is on Box-1. Hence when you are sending a messages to the Source Destination and the those messages are been consumed by Target Destination. There are times when some messages are delivered unsuccessfully like if the transacted session used to consume them has rolled back for some reason. Such a message goes back to the JMS destination and gets ready to be redelivered as per the configuration settings. It can be possible for a message to be delivered again and again without any success and those messages are never delivered and remain in the destination. These types of messages can become POISON messages, due to which other messages in the queue cannot get consumed and a plie of messages stacks over the queue and result many other issues. So the question comes into the picture how to prevent this? Here comes the Dead Letter Queue (DLQ) to the rescue, after a specified unsuccessful delivery attempts (i.e. 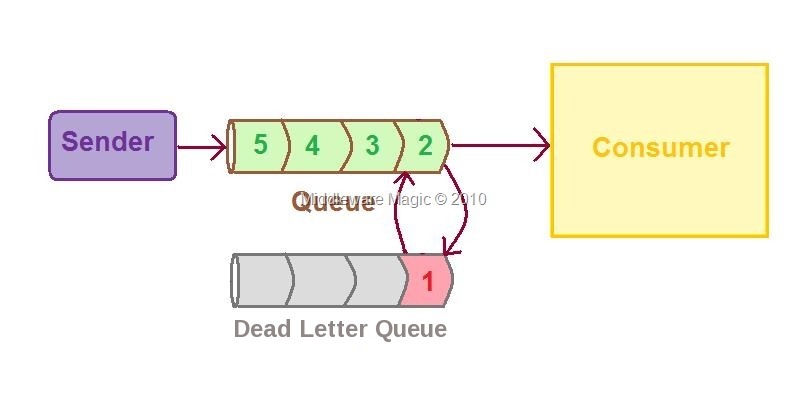 MaxDeliveryAttempts), the message is removed from the destination and moves it inside the defined Dead Letter Queue (DLQ) where the messages can be consumed for further investigation. In this example would make sure that if a message is having a string as “Hello World”, then that message would be rolled backed after specified unsuccessful delivery attempts and would be moved in the DLQ and other messages can be consumed without any issue. That’s it !!! You are done configuring a simple queue having a MaxDeliveryAttempts as 3 with DLQ, now if a message does not get delivered in 3 attempts then that message would be moved to DLQ. Let’s test this out using the sender and receiver Java code. Create a Directory somewhere in your file system like: “/urs/JBoss/JBM/Queue” to write the QueueSend.java and QueueReceive.java programs. In QueueReceive.java copy the below program, which has a creating a transacted JMS Session and in “onMessage” we are checking it the text message which is been received contents “hello world” ignoring the case would get roll-backed if not would get committed to test our DLQ. // Here we are rolling back the session. With the “java QueueSend” and “java QueueReceive” command you have to give the<Protocol>://<IP-address>:<Port number>of the managed servers in different prompts.